After finishing up my first year of grad school stateside this past year, I am finally down in the Sacred Valley to see what we have put together, and to work on developing the organizational aspects of the dormitory. My major goal is to figure out how many families in the surrounding communities have girls who cannot access a secondary education, and out of those girls which ones want to attend school. Then we will hopefully be able to figure out the most equitable way to choose the girls who want to go to school next year. What I found when I arrived at the dorm were six very happy and energetic girls. They greeted Eli like a favorite uncle, calling him Tio Lizandro (or Uncle Lizandro). My reception was also warm, Eli introduced me as Tio Joseph, and with a few giggles the girls welcomed me to the dorm. The dorm itself was clean and more spacious than I expected. The girls had a hundred questions and requests for Lizandro, so during that time I met Rachel and Sarah. Like Eli said in a prior post Sarah is tutoring and teaching the girls biology, and Rachel is tutoring, teaching English, and generally being awesome. We are really lucky to have these volunteers, and I am especially lucky because Rachel is interested in helping me with the aspects of the project that I came down to do. After the introductions and general questions and day to day tasks, the girls, Eli, the volunteers, the housemother and I played volleyball in an ancient square until the sun went down. Maura, our housemother, is a quiet and friendly woman who has a great relationship with the girls. They all get along, and she is very nice to them, but has a good grasp of getting them to calm down and do the chores and work that they need to do everyday. She is from Cuzco, and has a family down there, but her daughter has grown up, and she is now able to take a job 5 hours away. 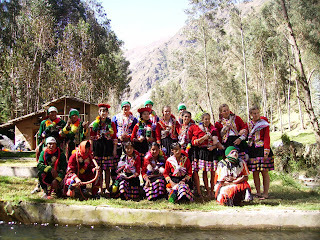 The distance seems to be the hardest part for her, as she has never been to Ollanta and doesn’t know any one in the town who is her age. We are hoping to have a party for her in the near future, so that she can meet people and build a community. 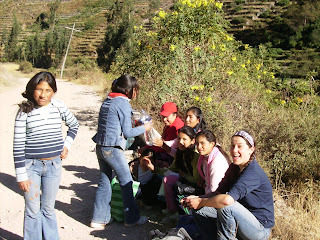 Since the girls did not have school Thursday due to the Paro, or strike, we decided to take them up to Pallata, where Yesica and Dina are from, to visit with Alex and the kids from the Rustic Pathways service project. The hike up was beautiful, and after a little grumbling about the heat the girls really enjoyed their walk up. This was the first time that the girls got to see their housemates’ community. Yesica and Dina were especially excited because they got to go home early. The village was picturesque, houses were scattered along the side of a mountain leading down to a lively little river. Fields and narrow pathways made up most of the space in the valley, with a few houses scattered around a little further away from the center of the village. There is only one road in the village wide enough for a car, and electricity seems to be a grand luxury. The houses are adobe with dirt floors. The girls went down to where the Rustic Pathways group was camping. They were really excited to see Tio Alex again. They all gave him hugs, and then they introduced themselves to the group in English and Spanish. It was amazing to see the girls make full English sentences in front of a bunch of teenage strangers. It was very brave of them. The girls then did cultural exchange with the Rustic pathways kids. Braiding hair, playing games and learning English/Spanish were the activities of the day. After the fun and games there was an inauguration of a cuy hut, a place where the village will raise guinea pigs to sell. Cuy, as it is called in the Sacred Valley, is a delicacy in Peru. After the inauguration we had a cuy feast, complete with dancing. Well, out of the one-hundred things that are new and exciting, these two days were highlights. The work I will do has not yet started, acclimating to the culture, making friends and seeing how things are done in the Sacred Valley are my goals for the first weeks. There will be more to come when I head up to the highlands to meet the remote communities. There are many things to be done, but what I have seen has really impressed and inspired me.